In M. Video features three bonus programs that allow customers to save when purchasing goods in shops. One of them is for holders of bonus cards, as well as two co-branded credit cards from alpha Bank and Cetelem. 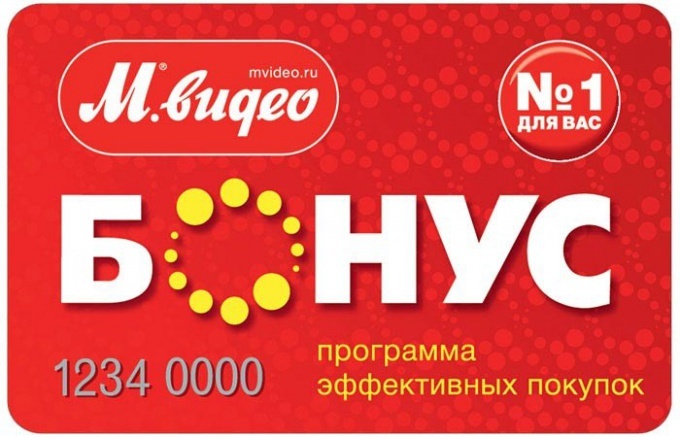 The participants of the program "M. Video BONUS" shall receive compensation in the form of bonuses for each purchase. They are credited with every purchase at the rate of 30 rubles = 1 bonus ruble. On the day of birth and during special promotions may be 2-3 times more bonuses. Bonuses can be paid up to 100% of the purchase at retail or online store. Importantly, the account was not less than 500 bonus rubles. After they accumulate, the program participant receives an SMS or an email with message about activation of the discount. Bonuses are accrued on the membership card. Get it can any adult citizen of the Russian Federation when making a purchase there. After receiving the card you can register on the company website or at the front Desk. Along with a map are given their mini-version of the so-called "Bonus charms". They can be distributed to friends and family and accumulate points together. Also in the framework of the M. Video Bonus will be offered two types of credit cards. This is a map of regular shopping M. Video BONUS Alfa-Bank card and easy credit purchases M. Video-BONUS — Cetelem. Them bonuses are awarded as follows: for every 20 p. M. spent in Video and for every spent 60 p. in other stores – 1 ruble in the account. It is necessary to consider that the bonuses you need to spend within 180 days, then they expire and cannot be restored. The balance of the bonus account can be found in several ways. So, you can go to the website M. Bonus on the main page to choose your card for which you want to find the balance. Card buyer M. Video press the button "to Check the bonus account, then in the opened window, enter the card number, ZIP code and your birth date. For maps M. Video BONUS Alfa-Bank and M. Video-BONUS — Cetelem need to specify the last digits of the credit card and date of birth. You can also log in to your account on the website M. Videos and to get there all the information. To know the status of the account over the phone by calling the Center responsible for customer. Rooms for calls: 8(495)-777-777-5 for Moscow and for regions 8-800-200-777-5. Here you can report wrong calculation of points. The participants of the bonus program also have the opportunity to use the "Virtual key". For this you need to send SMS with an eight-digit card number (without spaces) to the number 7550. A reply SMS will contain the current balance. This possibility is provided only for bonus cards. It is worth to note that SMS is chargeable. The cost varies depending on the operator, but does not exceed 1.77 R.